Your family will love this flavorful hash brown casserole. 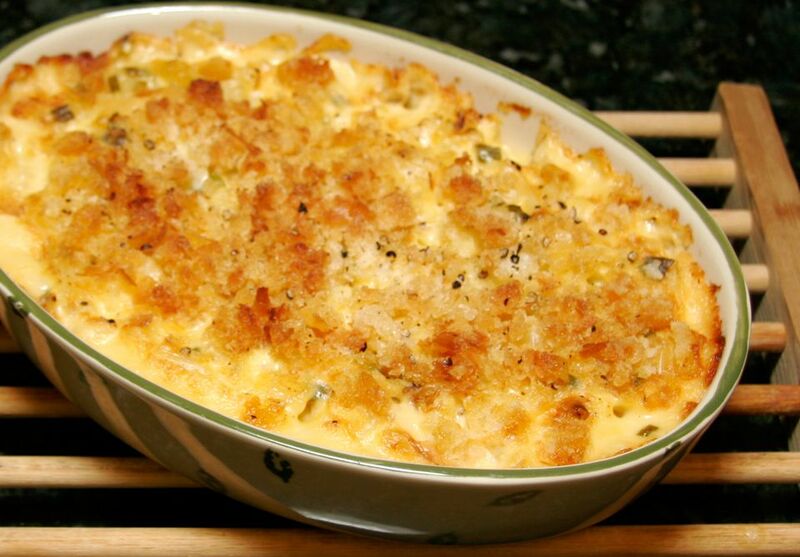 The frozen hash brown potatoes are combined with a homemade cheese sauce (no soup) and then the casserole is topped with soft buttered bread crumbs. This is an excellent potato casserole to serve with a big breakfast or brunch, and it makes a tasty dinner side dish as well. Butter a 1 to 1 1/2-quart casserole. Heat oven to 350 F.
In a saucepan, melt 4 tablespoons of the butter; add green onions and cook for 1 minute over medium-low heat. Add flour and stir to blend well. Cook, stirring, for 2 minutes. Gradually stir in the chicken broth and milk. Cook, stirring constantly, until thickened and bubbly. Stir in salt, pepper, potatoes, and cheese. Spoon into the prepared baking dish. Put bread crumbs in a bowl. Melt remaining 1 tablespoon of butter; drizzle over bread crumbs and toss to blend. Sprinkle the buttered bread crumbs over the casserole. Bake for 45 to 55 minutes, or until hot and bubbly and topping is nicely browned. Put frozen hash browns in a shallow container and thaw them in the refrigerator overnight. To thaw quickly, microwave them, stirring frequently until the potatoes are thawed. Pat dry with paper towels before using. If you can't find the diced "Southern-Style" hash browns, shredded can be substituted.